NEW HAVEN — Like many teenagers, Brielle Behuniak sometimes struggles to find a delicate balance between school, sports and her social life. There’s never enough time in the day for Behuniak to do everything she wants, so she must make sacrifices. Such is life. Fortunately, Behuniak, a three-sport athlete in tennis, basketball and volleyball, feels like she has a better grasp on how to juggle her jam-packed schedule after heeding the advice of a former world class athlete. 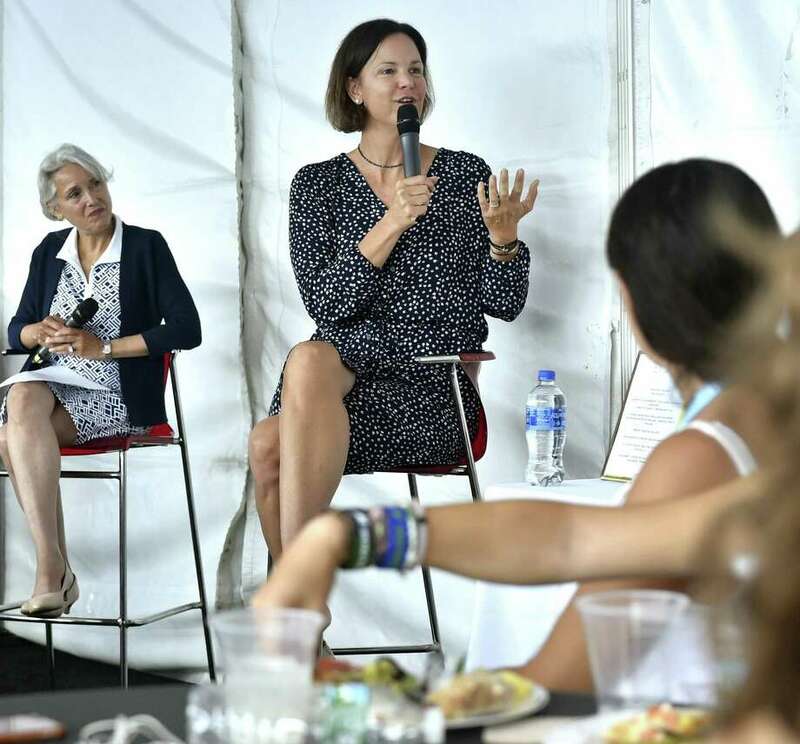 Lindsay Davenport, the 2005 Pilot Pen champion and former top-ranked women’s tennis player in the world, spoke to more than 100 high school student-athletes Monday at the Connecticut Tennis Center for the Anthem Girls Symposium. Davenport, who turned pro when she was just 16 and proceeded to skip college, won 55 singles titles — including three Grand Slam titles — 38 doubles titles and an Olympic gold medal in a career spanning 17 years. She was ranked No. 1 in the world eight times. In hindsight, Davenport wishes she would’ve relayed that advice to her younger self — the one who needlessly worried about things she couldn’t control. Over her more than 20 minutes with the microphone, Davenport recited several stories, including how she once locked herself in her hotel room for 48 hours following a loss because she didn’t know how to cope with losing. Those anxieties followed Davenport off the court. “All through the 90s, I would stress about what they’d write about me in the newspaper,” she admitted. Davenport found resilience through sports. She learned lessons that she now passes on to Madison Keys, the World’s No. 14 player whom Davenport has coached on and off since 2015. Davenport felt a sense of nostalgia returning to New Haven, where she was a six-time finalist. She participated Monday night in a mixed doubles exhibition along with James Blake. There was nothing for Davenport to worry about on Monday, only lessons to be passed on.